When using a floor mat on the floor carpet, make sure it attaches to the floor mat anchor(s) in your vehicle. This keeps the floor mat from sliding forward. Do not install aftermarket floor mats that are not capable of being securely attached to the vehicle's floor mat anchors. Unsecured floor mats can interfere with pedal operation. 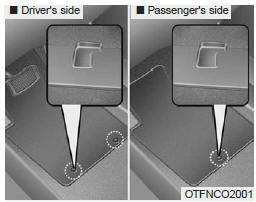 The following must be observed when installing ANY floormat to the vehicle. Do not use ANY floormat that cannot be firmly attached to the vehicle's floormat anchors. Do not stack floormats on top of one another (e.g. all-weather rubber mat on top of a carpeted floormat). Only a single floormat should be installed in each position. IMPORTANT - Your vehicle was manufactured with driver's side floormat anchors that are designed to securely hold the floormat in place. To avoid any interference with pedal operation, Kia recommends that only the Kia floormat designed for use in your vehicle be installed.